Welcome to Mookie Loves Bread….this is a Blog where I will post recipes for Bread that I have tried along with photos and comments. Mookie is the name of one of my 4 cats that my wife and myself cohabitate with. 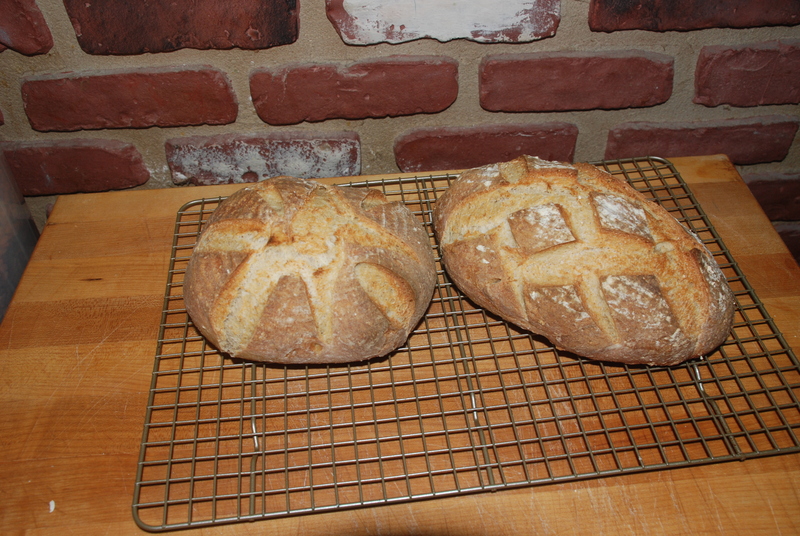 I enjoy trying new and different bread recipes and tweaking them myself. I just found your website. My daughter Pam got a sunbeam bread Maker. Hi Nina…it’s nice to hear from you. I am doing okay, how about you? Hi Ramona, Thanks for the feedback. Actually I started my starter using raisins and apples. I then added some cherries instead of the raisins along with some apple. I know the different fruit will have a slight effect on the taste but it is not overpowering either way. I suggest once you build your starter you experiment and see which type of fruit etc. works for you. Some people also use tea instead of fruit and have great results. Youc an certainly stay with just the raisins if you prefer and will have great results I’m sure. Hi Ian, I found your blog on TFL. I’m a fellow Long Islander who loves to bake, cook and all things food. Your baking is amazing and creative, so my question is where did you learn artisanal baking? Btw, we are cat lovers with 2 resident cats. Thanks for your comments. I basically taught myself by reading some very good bread books. The last year I’ve been visiting a website http://www.thefreshloaf.com where I’ve learned a lot from some great bakers. If you need any help don’t hesitate to ask. Thanks Ian, I visit the fresh loaf regularly also, but I work full time so my time is limited. I’ve tried to make a sourdough starter before but without the expected results, maybe I should try it again. You should give it another try. I work full time also and it’s not that hard to work to work it around your schedule. Where on the Island do you live? The only other “mookies” I know are my daughter, son-in-law and their 2 little kids; I thought the name was an original, but I guess not. They are the mookie family. I like your website. I’m another “bread-head” and saw your posting on TFL. Ditto about the passing of Eric; how sudden that was–and I too will miss him sorely. That’s so funny to hear about your family of Mookies! He is the leader of our pack of 5 and is a big ham starving for attention. I’m glad you enjoyed my post. It certainly was a shame about Eric who was taken way too early. Hey Ian! Finally looked up your site. I didn’t realize you had so many cats along with your dogs! You guys are awesome. Glad you had a chance to check it out. We had the cats first and they are not too pleased with the dogs…that’s for sure :). I read you are using 66% hydration sourdough. currently I am using “old dough” initially made as regular 100% sourdough at the first few days. but now kept as “old dough”. I would like to have a dry sourdough like yours. I couldn’t find if it should start as a 100% or as a 66% and how it should fed and how frequently. I heard some keep it in water and some rep it with cloth. there are not really much about it in the web. I want to deeply understand before I start. can you give me good links to your posts or others, that are talking deeply about those special types of sourdough and how to make them and how to maintain them. I understand from your post that I can use them in any recipe and just have to add in the “missing” water. I want to make a spelt or rye sourdough, not sure which one is the best in 66%. Sorry for not replying sooner Anat but I’ve been traveling a lot the last month. I keep my mother starter at 66%. There are many articles on how to create your own starter. Go to http://www.thefreshloaf.com and type in how to make a starter and you will get some great posts. Once you create your starter it’s very easy to maintain it. Since I keep mine at 66% and I like to keep around 600 grams or more so I take 99 grams of mother starter add around 187 grams water and 298 grams of flour, mix for a couple of minutes and put in a container at room temperature for 6-7 hours until doubled. You can then use this straight in your recipe or take a piece of it and build a separate starter as you desire. You should try and learn bakers percentages. Go to The Fresh Loaf and you will find some great tutorials explaining how that works. Once you understand that you can easily convert recipes to use your starter or you can convert your starter to fit what the recipe calls for. The hydration of the starter will effect amount of sour in some cases but for the most part you can use a 66% starter in just about any recipe.